ALASKA was shaken by a magnitude 7.0 earthquake on Friday and has been experiencing aftershocks since, with 18 registering as magnitude 4.5 or higher since November 30. 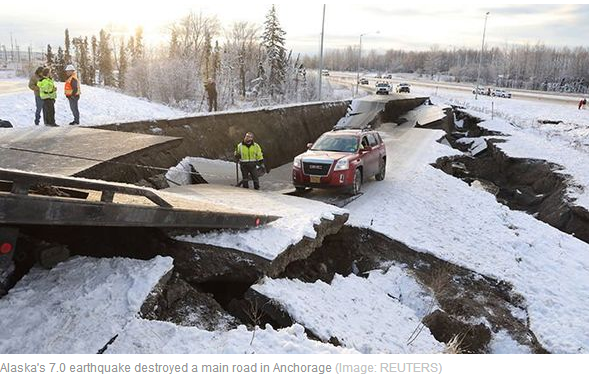 On Friday, November 30 Anchorage in Alaska was struck by a huge magnitude 7.0 earthquake. Shocking images shared to social media showed the devastation, with a main road torn apart with the force of the quake. There have been numerous earthquakes since, but the road has now been repaired. https://www.express.co.uk/news/world/1055205/alaska-earthquake-update-anchorage-repairs-aftershocks-ring-of-fire#t=9s Alaska’s Department of Transportation and Public Facilities (Alaska DOT&PF) worked quickly to repair an off-ramp connecting International Airport Road and Minnesota Drive in Anchorage. The ramp had jagged chunks of concrete and holes, which has now been repaired. Since the huge magnitude 7.0 earthquake on Friday, Alaska has felt 18 earthquakes measuring 4.5 or higher on the Richter scale according to the United States Geological Survey (USGS). Alaska lies on the Ring of Fire, meaning that it is a hotspot for seismic activity. The most recent earthquake measured magnitude 4.5 and struck 13 km northwest of Anchorage on Wednesday, December 5. After the magnitude 7.0 earthquake on Friday, the next most powerful quake was one which measured magnitude 5.6 on the same day. Despite the speedy road repairs, there is still a lot of work to be done in Alaska following the huge earthquake. Authorities have identified 50 locations on state-owned infrastructure that are still in need of repairs.